Two story single family home with five bedrooms, and three bathrooms Located in the Oak`s Bluff section of the Martha`s Vineyard Island. centralized and convenient location. Located in the Oaks Bluff section of Martha's Vineyard, our single family home was Built in 1870, and renovated in 1973, and then again in 2017. The home is approximately 1,700 Sq. Ft., and there are three entryways. 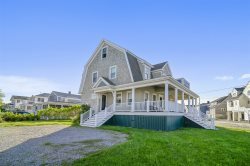 Walk to beach, town (Circuit Avenue), public transportation, including Steamship Authority’s Woods Hole ferry terminal, public parks, shopping, restaurants, Movie Theater and marina. Across the street from Veira Park and the house offers wonderful views of the park. Private parking for up to 6 cars. House has 5 bedrooms and 3 full bathrooms. All appliances are new, including washer and dryer. Three flat screen TVs equipped with full cable line-up. Enjoy the beautiful views of Veira Park from most bedroom, sunroom or covered front porch. Grill up dinner on the over-sized deck nestled away from all the fan-fare of this centralized and convenient location. 1 small room that can be used as office or small bedroom. 1 small room that is used as a laundry room. Four flat screen cable TVs.